With the countdown to the big day just 10 days and counting (ahhhhhhh!) I’m definitely feeling the pressure. 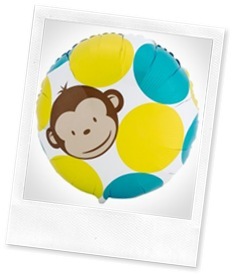 Ordered the mod monkey plates, napkins, party hats, monkey pinata, cups etc from 1stwishes.com. 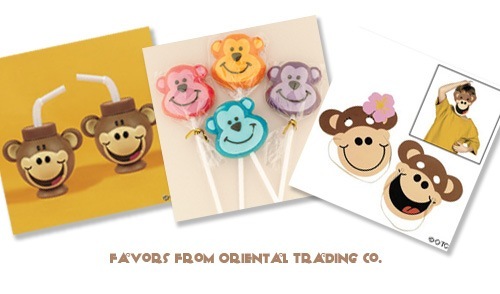 Ordered a slew of other things from Oriental trading including monkey bubbles, monkey head cups, monkey bean bag toss game, pinata candy and toy assortment, yellow party bags for favors, monkey masks and foam balls so we can play “dodge the coconuts.” Dodge the coconuts is like dodge ball, except instead of throwing the ball AT the other team you throw the balls up in the air and the kids have to try to not get hit by the falling “coconuts”. 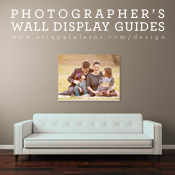 Created and ordered a poster from PoseterBrain.com. For $20 shipped you can get a large 3 foot x 4 foot poster printed. We will spray glue and attach it to foam core to create our “pin the tail on the monkey” game. Make a practice cake because I am soooo not a baker. The cake I am going to ATTEMPT to make is only 6”, so I think I will have to make cupcakes too! Design and make a birthday banner (I already bought the supplies). Make favor tags for the goody bags and cupcake toppers. Figure out WHERE in our little property we can fit 30 people! If we want to use the yard for some sprinkler and other games for the kids, we will have to fit a LOT of seating under our pergola. Speaking of seating I think we will need to rent some chairs too. Not really party related, but I need to squeeze in some time to do Jasper’s cake smash photos. Which requires me finding a cake to smash that I like for pictures (no, I’m not going to attempt to make that one!). Make Jasper’s One Year video/slideshow. Make him a shirt with a mod monkey on it using inkjet tranfer paper.. or just buy this one from Etsy! Hmmm, I think there are a few dozen other things that I’m forgetting, like that we have to eradicate the ant problem down on the lawn so we can play games there, and powerwash the wicker chairs and oh about a million other little things to get the house ready for so much company. Party at chucky cheese is sounding really good right about now! A Blog post with links to tons of real people’s birthday parties.. fabulous for ideas. 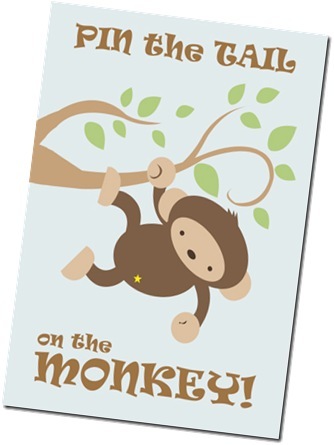 Mod Monkey Birthday Party Invitations – yep, I opened an etsy shop, you can grab my design here! Mod Monkey Pin the Tail on the Monkey Game – get this from my etsy shop too. 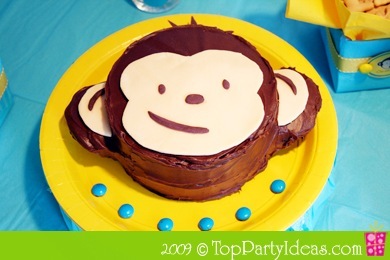 Monkey Birthday Party from Hostess Blog. I’ll probably keep adding more links as I find them. What were your best sources/links for party planning? I am also doing a mod monkey themed birthday for my son’s 1st birthday.. I have gone monkey crazy!!!. I made monkey munch!!! my version on monkey food.. trail mix but with goodies like mini honey chex, mini marshmellows, m&m’s raisens. etc. made chocolate covered bananas. dont make the fondant,, just but it at ac moore of micheals use a 50% coupon, saves you time and money.. load pics when u can i will too.. i have more than 100 guests invited so i am really going nuts,, even made jello shots for adults to match blue an yellow dots.. I realize posting this makes me the “allergy geek” but one thing I have read is that a true chocolate allergy is very rare – like less than one in 500 people. Studies have been conducted with patients who thought they had severe chocolate allergies and only a handful of them were actually allergic to cocoa. Turns out that most people who think they are allergic to chocolate are actually allergic to one of the other ingredients in processed chocolate or have reacted to trace amounts of dairy or nuts in chocolate that was processed on equipment also used to make candy containing dairy and nuts. A chocolate cake made from scratch using 100% cocoa powder would be really unlikely to cause a reaction. Landon’s big party is Saturday. I am so not ready. How am I supposed to get everything done when I work full time? And the fact that I’m a professional event planner adds just a little more pressure to my plate. I’m loving all of your plans, Ariana! The party looks and sounds like it is going to be amazing!! You got me inspired to get to work. Now, I just need to find the time:-). Looks amazing! Thanks for the great links, too! Only three more months until Ava’s party — yikes! I’m sure your cake will be adorable AND yummy. I definitely want to bake Wes’ cake even though I also would not consider myself a real baker (I was a Daring Baker for a while but then got pregnant and had no time for anything not baby). I can’t wait to see the photos from this party. I’m sure you’re feeling the pressure now, but with your creativity, the party is bound to be a hit! Oh… that butter needs to be SOFT… room temperature! That cake on flickr looks awesome, and really not that difficult. You can do it!!! You would be shocked how LITTLE gel coloring it takes to tint your fondant. Literally, like 1-2 toothpicks dipped into the color. The blue on James’ cake took I think 2, for a pretty big ball of fondant. I have not heard anything about avoiding chocolate… I think anything you make yourself with pure ingredients should be fine… plus, they really don’t end up eating THAT much of it. James’ smash cake was chocolate. Maybe make a chocolate practice cake and let Jasper try it prior to his party. I did use Crisco (as much as I hated to) with the marshmallow fondant… you HAVE to… it’s so incredibly sticky at first. Again, the amount that will actually be eaten is negligible. Here is my recipe for Swiss meringue butter cream… easy,foolproof, and so totally delicious (and I don’t like frosting usually) it’s the only kind worth eating in my opinion! Note: (you could also add additional flavorings like a touch of lemon, orange, raspberry, or coconut extract, or up to 1/4 c of lemon juice. Or you could up the vanilla a tiny bit… but it’s delicious as-is. Whisk together the egg whites and sugar in a metal or glass bowl (use your stand mixer bowl, if you have one) placed over a pan of simmering water. Whisk constantly for about 3 minutes until the sugar is dissolved and the mixture is hot. Switch to your paddle attachment and while mixing on med-high speed, add one stick of butter at a time, beating it until smooth each time. Once all the butter is in, give it a good 6-10 minute beating on high speed until it is thick and very smooth. If it breaks or looks wrong during this time, don’t worry, it will come back together. Add your flavoring (vanilla, or whatever you’re using) and beat until incorporated. You should have a very smooth, shiny, white buttercream that will taste DELICIOUS. Tint with a tiny amount of gel coloring if desired, again beating until just incorporated. This recipe will make enough for one 9-inch layer cake. If you need more, the recipe doubles easily. Heather, words to live by! I agree with Kimberly – soooooo ambitious!!!! But you can totally do it – and looks like you’ve gotten so much done already. I can’t wait to see pics. I have a feeling you’re gonna put that party planner blog to shame. Of course, if for some reason the cake doesn’t turn out quite right, I’m sure it could still be a hit on the cake wreck blog! lol. Just remember to breathe and enjoy the planning and the party!!!! We made a similar monkey cake for my son Jake’s first birthday, and the chocolate icing was fine (actually…I just used pre-made). He was so tired by the time we had the cake that he was almost dozing in his high chair, poor little guy! Really, my words of advice having just planned a similar party was…order whatever you can, and make sure YOU enjoy the party. Like you, I’m very much a do-it-yourself kind of girl, and have a huge desire to design and make everything myself, but I realized I just had to NOT do everything myself for his party, or else I would have no time to spend with him. So, relax as much as you can, and enjoy…it sounds like it’s going to be amazing! Oooo!!! Can I come to Jasper’s party, pretty please – I’ll help with clean up duty ;) It sounds like it’s going to be a blast! 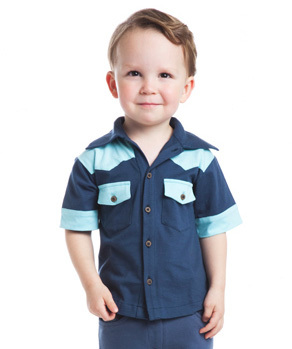 And if this party planning is any indication of birthday parties to come – Jasper is one lucky little guy! I have many fond memories of birthday parties growing up. My Dad planned them all (he raised us kidlets as a single Dad). He did an excellent job and my friends always raved about the goody bags (always so much candy! Lol). I remember at a certain age a lot of my friends were having birthday parties at McD’s and I was totally jealous. But thinking back to the parties my Dad created for us, the decorations, the games, the food (we always had pop in the old glass bottles – my fav being Tahiti Treat…*sigh* those were the days) I am so thankful for all of those wonderful memories. and now I want to make that one! But that’s a lot of fondant coloring.. Yes please share buttercream recipe, I’m sure I’m not the only one who could use it! Speaking of chocolate, did you hear anywhere that it’s better to avoid chocolate for 1st bday if baby hasn’t had it yet? I was wondering about the chocolate icing my monkey cake recipe calls for..
Ariana, I am exhausted just READING about all of this planning. I hope you are not tackling it completely by yourself. Everything sounds super cute and fun, by the way. Good luck! its going to be a jungle!